Linseed oil has been used for many purposes in history. It is one of the oldest types of oil in Europe and people already used it since Antiquity. You can use linseed oil as a varnish to protect wood from the elements. It can be used as leather care or to color light leather dark. Another popular use is making oil paint. Oil paint has been used since the 2nd half of the 15th century. Before this period, paint was made with an egg tempera base. Please note: fabrics drenched with linseed oil are flammable. Keep it out of reach of hot sunlight and other hot temperatures. These fabrics are otherwise useful as lighting material for the campfire. 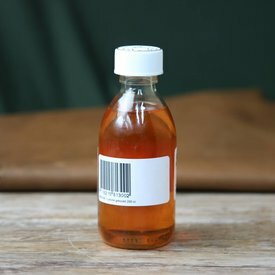 This bleached linseed oil is sold per bottles of 1 litre. It is the basic material for various purposes. The bleached oil is cooked and refined and leaves less color than raw linseed oil. The oil is also treated with pale earth which has removed the mucus. As a result the color is also ligher than normal cooked linseed oil. Caution: fabrics drenched with oil are flammable. This item can not be shipped outside Europe.